This week's challenge over at the Crazy 4 Challenges Blog is to create a card using at least three different geometrical shapes........Squares, Circles, Rectangles, Octagons, Triangles.......you name it, just make sure that you have three of them on! I decided to use Karen Giron's Sweet Sunday Sketch #40 for the layout for my creation, and it took shape with circles, diamonds and rectangles. Fun! 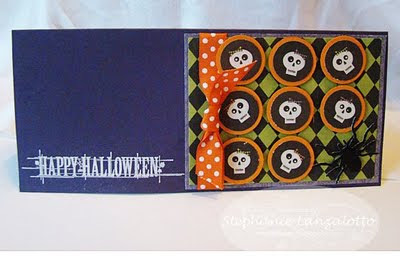 Paper ~ Elegant Eggplant, Pumpkin Pie, Black, Cast-A-Spell DSP, Imaginisce Hallowimsy - Lollipop Lizzy, black glitter paper. Accessories ~ White embossing powder, MS spider punch, Nestabilities, 1" circle punch, dimensionals, 1/2" orange polkadot grosgrain ribbon from Sharon Johnson's ribbon store.